Sturgeon is a family of fish that can be divided into twenty seven species. They are considered by many experts to be primitive fish since they display characteristics which have largely not changed since the beginning of their fossil record. As such, they are considered living fossils that can make an excellent addition to ponds. They can be found in subtropical, sub-Arctic and temperate waters in both North America and Eurasia. When adding these fish to your pond it is important to consider their size. 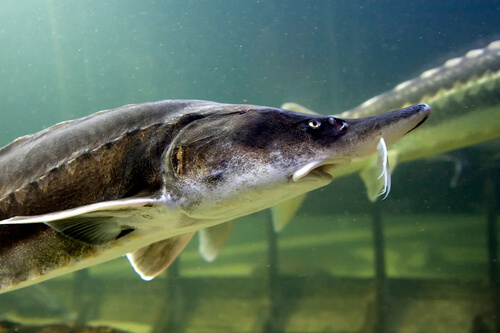 Sturgeon should not be kept in ponds that are below one thousand gallons of water and larger ponds are most optimal, particularly for species which are active. Some subspecies, such as the Siberian or Beluga sturgeon, should only be handled by experts in ponds that have between 6,000 and 15,000 gallons of water. Another attribute which make sturgeon a great addition to private ponds is the fact that they mix well with other fish. They are harmless to most large fish like koi but may prey on small fish which are 3 cm or lower in size. However, smaller fish tend to be fast so it will be difficult for sturgeon to catch them. Sturgeons are vulnerable in hot weather, and as such should be monitored during summer. The reason for this is because they need lots of oxygen, more so than other types of fish which can live at lower levels. This means pond owners should use a backup system for their air pumps during hotter months. Sturgeon should not be kept in indoor ponds, because they grow too fast and need lots of space due to their size. They require filtration which is beyond what is normally needed for a pond, due to their need for higher levels of oxygen. In regards to diet, it is important to remember that sturgeons are pure carnivores. This means that unlike other fish they do not eat plants and instead consume meat. When and if sturgeons become ill, it is best to treat them with salt, not the common salt that you buy at grocery stores, but PDV salt. You will need to add approximately 0.15 gm. for each water liter and let the fish rest for about fifteen minutes. This treatment should be done for a day, discontinued the next day, and then restarted the following day, and so on, until the fish heals. This treatment will eradicate most types of parasites and fungus. There are also medications which can be used. Sturgeons are well adapted to cold weather and will have no problem with it. In fact, their survivability during winter is much higher than in summer. However, pond owners must carefully watch sturgeon that are sharing a pond with other fish, because sturgeon food is rich in oil and protein and the other fish might hog it all for themselves, leaving the sturgeon with nothing to eat, so make sure during feeding that the sturgeon are getting adequate nutrition.